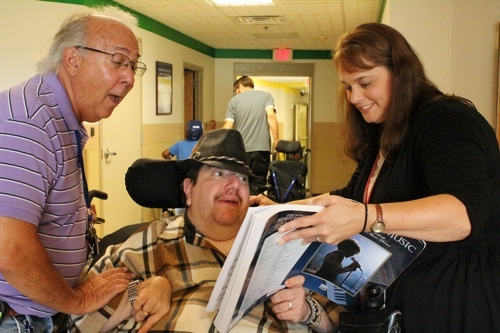 Adult patient Tony Santia, center, selects a song, assisted by rehab technician Skip Kessler and music therapy director Lynn Coyle. 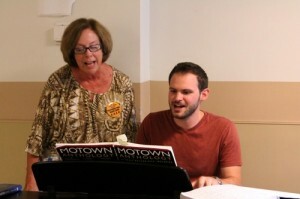 That was the invitation delivered to Matheny staff members, students and patients on Wednesday, August 15, for a mid-week program called “Singing for Yourself” held during lunch time by the music therapy department. Music therapists use various types of music to positively impact students’ and patients’ cognitive, physical, emotional and social skills, helping them realize their potential in society. Activities and techniques include improvisation, rhythm, songwriting, songs, chants, instrumental activities, live music and recorded music. Employee nurse Joan Ray sings along with music therapist Greg Perkins. This entry was posted in Uncategorized and tagged music, music therapy, Singing for yourself. Bookmark the permalink.